You'd be forgiven for thinking there was only one processor manufacturer when it comes to laptops - Intel's hold on the market is so complete. There is another option though, and it's one that's making a renewed push to claw back some market share. AMD has always made more of an impact on desktop PCs, but it's also been beavering away building Fusion processors, or APUs - chips that combine traditional processor cores with graphics capabilities. These are a natural fit for laptops, where a single processor makes for a far thinner machine than separate central processor and graphics units, and the fact that AMD bought ATI a good few years ago means that the graphics capabilities of AMD's chips should far surpass what Intel currently has on offer. Indeed, the APU inside this latest Samsung machine boasts a much improved graphics core over the first generation of APUs - namely a Radeon HD 7500G GPU. The graphics might be pushing things forward, but the A6-4455M is actually one of the lesser chips in AMD's new APU range, boasting just a pair of processor cores. When you consider that the likes of Intel's Core i3 can handle four threads at once, this automatically puts this chip at a disadvantage in raw computing terms. Sure enough, it lagged behind similarly specced machines in our tests. Samsung hasn't left AMD to do all the hard work though, and has built an attractive and potentially capable laptop around this core. 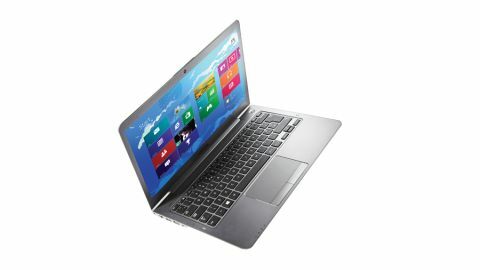 This includes a 13.3-inch screen and a healthy 6GB of RAM. We've fallen in love with SSDs and we're not convinced that traditional hard drives like this 500GB effort can still cut in laptops, but it gives you plenty of space for movies, music and other files. If you're looking to move a lot of data around on a regular basis, then you could make an argument for this over a much smaller SSD for the same kind of cash. This may not be an Ultrabook (Intel has exclusivity on that term), but the elegantly sloping chassis, simple colour scheme and thin screen make it a very attractive laptop - certainly not one that looks like it costs just £500. Samsung can be applauded on the input side of things too, with the large and spacious keyboard making for a comfortable typing experience. There's no numpad, but this seems a reasonable cost in order to create a comfortable typing space. The touchpad is large and only slightly recessed from the chassis, which is important for Windows 8 gestures. The buttons are clearly defined and offer a good sense of feedback. Even so, we found some gestures difficult to pull off at first, and it takes some getting used to. The 13.3-inch screen, meanwhile, is one of the machine's strongest points. It's bright, and the native resolution of 1,366 x 768 gives you plenty of room to work with. This resolution should work well with the graphics core for games too, although in practice we didn't see much different to Intel powered machine - titles that aren't supported by those aren't playable here either. If you want to play games on your laptop then you're going to have spend a bit more than this. It was the battery life that shocked us the most. While Samsung may quote up to six hours, when we really pushed the machine its battery expired in a mere two hours. Admittedly you should see significantly more in normal use, but we'd expect much better stamina, even at this price.